This was a blast from the past. I bought this book when Thomas was born because I remembered reading it a kid and, I think, seeing it on TV. We didn’t read it for ages as it isn’t a hard cardboard book and up until recently Thomas would have just destroyed it in minutes. When I did finally take it down of the bookshelf it was instantly adored. The book was originally published in 1965 and was written and illustrated by Judith Kerr. To be honest the story is looking a bit dated now with the mother staying at home to look after her daughter and prepare tea for her faithful and all-knowing husband. 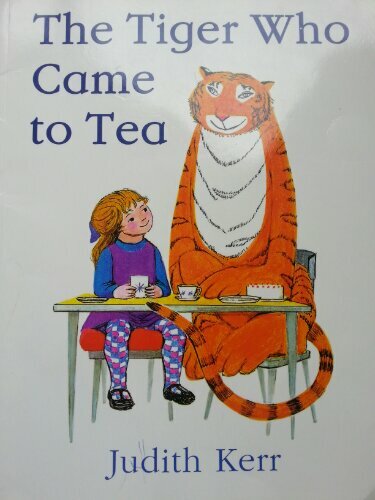 Once she has let the tiger in to the house to have tea (!?!?) and he has eaten and drunk literally everything she has no idea what to do until her man comes home with the perfect soulution of going out to a cafe. There is also a milkman and a grocery delivery boy who turns up on a bike! Anyway, sexualy politics, high-street economics and being a little bit un-PC aside, this is a great book for Thomas. He loves the colourful pictures of the tiger and is intrigued by the different poses he pulls. Thomas loves to point at and touch the tiger’s tail, as well as pointing to the different things in the kitchen and the bedroom. His favourite picture is the one where they are walking down the road at night to the cafe because it has a car and a bus in it. I loved the book because of the trip down memory lane; Thomas loves the book because it has a tiger, a car and bus in it. What’s not to like?